Preheat oven to 350 degrees. Place almond flour, cocoa powder and brown sugar in food processor and process until there are no more lumps. Add melted butter and process a few seconds until just combined. Line muffin tins with paper liners. Divide crust mixture among 12 muffin tins. Use fingers to press down on crust. Bake for 5 minutes. Remove from oven and cool. Reduce oven to 300 degrees. Place strained cottage cheese in food processor (be sure to wash out after mixing the chocolate crust) and puree until smooth. Add sugar, vanilla, lemon juice and lemon zest and process until just mixed through. Add eggs and process until just mixed through. Pour into muffin tins (I used a liquid measuring cup with a spout for less mess). Bake for 25 minutes or until center is almost set. Remove from oven, cool, then refrigerate for 1 1/2 - 2 hours. Meanwhile, make berry topping by placing strawberries and sugar in a small saucepan. Bring to a boil, then reduce heat to medium-low and cook 5 minutes. Let cool; place in food processor and process until smooth; put through strainer if you want to get rid of seeds. Gently remove paper liners from cheesecakes and place on serving tray. Spoon berry topping on top of each mini cheesecake. 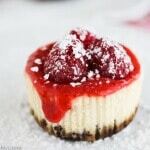 Decorate with a few fresh raspberries and sift a little powdered sugar on top.